At night, most of us plug in a jumble of wires and devices as we charge our smart watches, phones and fitness trackers. It's a pile that's unlikely to get any smaller as more and more wearable tech enters our lives. Manufacturers and futurists predict that these will soon be energy self-sufficient and that we'll be free of their mess. But the question remains: how? At the moment the only major portable power sources are solar chargers, but these have significant limitations both indoors and after dark. Kedar Hippalgaonkar, Jianwei Xu and their co-workers at A*STAR's Institute of Materials Research and Engineering (IMRE) think they could soon use low-grade waste heat – think car exhaust or body heat – to power devices. "An enormous amount of low-grade waste heat is being dumped into the environment", says Hippalgaonkar. Converting this heat into electricity is a big opportunity that shouldn't be missed. High-temperature thermoelectric generators are already a key source of power for space instruments. The Mars rover, Curiosity, and the interstellar space probe, Voyager 2, harness long-lasting nuclear heat. The latter has been running on this type of power for more than 40 years. "Thermoelectric power generation is not a new idea," explains Hippalgaonkar. "It's been investigated since the 1950s and there's been lots of research on new materials, but in the past most of the work focused on toxic, inorganic materials and applications with high temperatures of operation." Hippalgaonkar agrees that the proliferation of Internet of Things devices now brings with it a demand for non-toxic, portable power sources. Future body sensors and portable devices could be worn constantly if they harnessed body heat to be energy self-sufficient. "But to do that we need to develop suitable new thermoelectric materials that are efficient at lower temperatures, non-toxic and cheap to produce." The other major opportunity is to make use of any waste heat exiting through engine exhaust from cars, aeroplanes or ships, he adds. The electricity generated could then be fed back into the vehicle, lessening its environmental footprint. A*STAR's PHAROS project is focused on the materials that will make these thermoelectric generators possible. The five-year project started in 2016 and aims to find a material composition that is non-toxic and, ideally, Earth abundant (making it cheap), efficient, and easy to fabricate. To do this they are developing less toxic hybrid materials combining organic and inorganic elements, and they are pursuing those with potential for low temperature thermoelectric power generation. The project brings together Hippalgaonkar, a solid-state physicist and an expert in the behaviour of phonons, photons and electrons in nanoscale and 2-D materials, and Jianwei Xu, a chemist with an extensive research background in organic materials, especially semiconducting polymers. 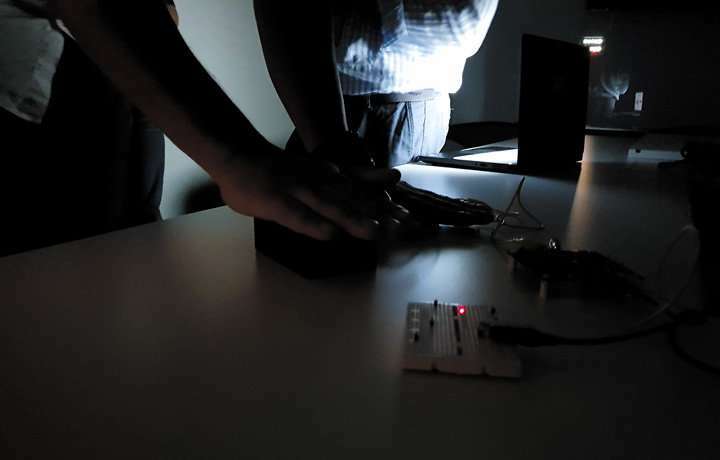 To charge personal devices using thermoelectric materials, a generator harnesses the Seebeck effect, in which a temperature difference creates an electrical voltage at the junction between two different materials (often, but not exclusively p- and n-doped semiconductors). This voltage can be used to drive a device or charge a battery. To date, the most well established and successful thermoelectric materials have been based on metal tellurides, including lead telluride and bismuth telluride. These are commercially available and have been harnessed as a power source in space, where they can locally generate electricity to power satellites and space probes. But they only work well at high temperatures, and in space an on-board nuclear isotope is used to generate this heat and to create a high temperature differential. The approach can act as a long-term, local power source, but the potential health risks of nuclear radiation mean it's not suitable for many terrestrial applications. "There's a lack of efficient materials that operate at around room temperature and that's what we want to address with the PHAROS project," says Xu. However, it's a challenging task to identify new candidate thermoelectric materials, fabricate them and then understand what is happening to charge transfers inside them. To date, the PHAROS team has been exploring a wide variety of conjugated semiconducting polymers (such as Polyaniline, P3HT or PEDOT:PSS) for the organic component of their hybrids, which are then combined with an inorganic component made from, say, tellurium nanowires, silicon nanoparticles or 2-D materials like MoS2, MoS2. With these, they have investigated the use of carbon nanotubes as an additive. The team has also explored the thermoelectric potential of methylammonium lead iodide perovskites1, an inorganic-organic hybrid material system that has shot to fame in recent years following its successful use in solar cells. This hybrid material rivals silicon in terms of power conversion efficiency. The big advantage of using a part-organic system is that it suits solution processing, which produces large-area, thin, flexible materials that could be cheaply ink-jet printed. However, for a thermoelectric material to work well it ideally needs to have a large Seebeck coefficient, which is indicative of how large the voltage generated will be for a given temperature difference. And it is also important for the material to have high electrical conductivity to allow a charge to flow easily, along with low thermal conductivity to support the temperature gradient in place. "It's very hard to achieve these attributes simultaneously," says Hippalgaonkar. "You ideally want to find a material that combines the low thermal conductivity of wood with the high electrical conductivity of a metal and that's not easy to do." To make comparisons between materials easier, something called the 'ZT value' was developed to take into account the Seebeck coefficient, thermal conductivity, electrical conductivity and temperature. "We really want something that has a ZT of roughly 1," says Xu, although a ZT number that high isn't necessary for a lot of uses. At present, a 1 can be achieved in bismuth telluride and lead telluride, but both materials are toxic, expensive to manufacture and rigid. Recently, the PHAROS team has developed a safer material that is 10–20% of the way to a perfect thermoelectric scorecard. They did this in a collaboration with researchers at US-based Lawrence Berkeley National Laboratory (LBNL) by optimizing a materials system that combines a carefully designed conjugated polymer with tellurium nanowires. Encouragingly, ZT values of roughly 0.1–0.2 have been achieved2. This discovery was helped along by Shuo-Wang Yang at the Institute of High Performance Computing at A*Star and his team, who helped to explain the interactions between the organic and the inorganic constituents of materials prepared by Jeff Urban's team at LBNL. With experimental and theoretical work done by Hippalgaonkar's team, the physics of how charge flows in these complex materials was detailed for the first time, laying a strong basis for future development. "The interface between the organic and inorganic interface is very important to study," Hippalgaonkar explains. "The physics of how charge moves through such a complex landscape is very challenging to understand." "Thermoelectric will be able to provide you the opportunity to realize self-powered sensors fastest," says Hippalgaonkar. Heart rate monitors for example have very modest power needs, on the scale of a few hundreds of microwatts. A material with a ZT of 1 operating with a temperature difference of roughly 10˚C at room temperature generates roughly 50 microwatts per square centimetre, and, in theory, PHAROS's most recent material could achieve 10 microwatts per square centimetre. So, small-scale wearable themoelectric power is already tantalisingly close to reality, Hippalgaonkar says. And once its commercial promise starts to come into play, their work will only accelerate. A thermoelectric generator (TEG) is a device that converts a temperature difference into a voltage, and manages the flow of electrical current around a circuit. It is a means for converting waste heat into electricity. Such devices operate due to the Seebeck effect, which was discovered by the German physicist Thomas Johann Seebeck in 1821. 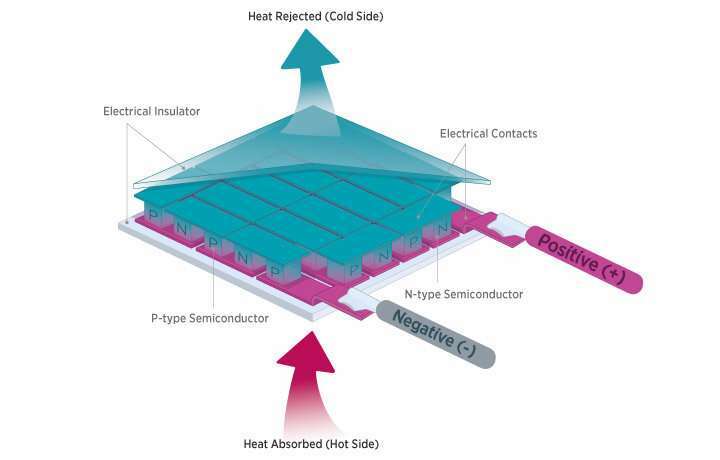 A TEG is typically made by using p- and n-type doped semiconductors to create two paths that connect to metal electrodes of different temperatures, one hot, one cold. The Seebeck effect means that holes (positive electrical charge carriers) in p-type material and the electrons (negative charge carriers) in the n-type material diffuse from the hot electrode to the cold electrode, thus yielding a voltage and current flow. The process can also be operated in reverse, when it's known as the Peltier effect and the injection of an electrical current induces cooling at the material junction. Thermoelectric coolers, also known as Peltier coolers, are often used in small-scale devices to control the temperature of sensitive electronic and optoelectric devices such as laser diodes and photodetectors. Thermoelectric power generation at room temperature: Coming soon? I look forward to the day when my clothes cool me and generate all the power my embedded devices need, as a nice bonus.